Game: "He's iconic to me, and his untimely demise is felt around the world"
LOS ANGELES, California (CNN) -- Many fans will always remember where they were when they heard the "King of Pop" had died. 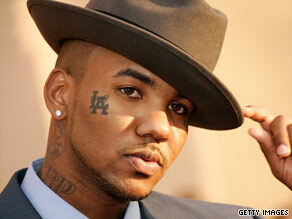 The rapper The Game will always remember what he did afterward. The Game created a tribute to Michael Jackson -- video and all -- within a day of Jackson's death. That same day, Thursday, June 25, he rounded up some famous friends, recorded a song, shot a music video and got a Michael Jackson tattoo etched on his upper arm. Actually, he got the tattoo while he was in the studio recording the track. Some people know how to multitask. The tune, "Better on the Other Side," isn't available for sale yet -- although he's hoping it will hit iTunes very soon. Because the record company was caught off guard, it is still playing catch-up. Game says all proceeds from the sale of the single will be donated to Michael Jackson's family. The companion music video is all over YouTube. In it, the 29-year-old shares the spotlight with Chris Brown, who sings the hook as a counterpoint to Game's rap. It's the first project Brown has appeared in since he pleaded guilty to assaulting his former girlfriend, Rihanna. The video, in various forms, had received more than 750,000 views as of Thursday evening -- not bad for less than a week in release. In the following interview, The Game (born Jayceon Taylor) recounts how the project came together -- with a little help from Lady Luck and the muse of Michael Jackson. CNN: You may be the first well-known artist to have a Michael Jackson tribute out there. Tuesday, join CNN for all day coverage as the world celebrates the life of a worldwide pop icon, and don't miss our prime time coverage starting at 8 ET. The Game: I didn't want to wake up the next morning and have somebody spread a tribute all over the Internet, and I wasn't a part of it. So I decided to take matters into my own hands. CNN: Did you already have the beats pre-recorded? The Game: No. The first thing I did was call DJ Khalil ... and I told him, "Yo, I need you in the studio, and by the time I get there, I need a Michael Jackson tribute song made [the music bed]. I need violinists, I need pianists, I need everyone in there for a production." And then I started reaching out to Diddy. He's on a set 18 hours a day, but he said he'd get it done some way, somehow. Talked to Chris Brown. He and [his manager] Tina Davis said they were on their way to the studio -- so they told me after I do my part, to bring it over and Chris will do the hook. Before I took the beat over to Chris, Boyz II Men walked into the studio randomly -- so they took it to their studio next door, laid down all the background vocals. Then I took it to Mario [Winans], then I took it to Diddy. In the meantime, me and my boy Taydoe -- we running around to the hospital, to the Jacksons' house, to the star on Hollywood, getting all this [secondary] footage [for the video]. Crazy. CNN: This was the day he died, on Thursday? CNN: You made the music video for $500. In death, will Jackson be more profitable? The Game: All in tapes, $500 went to tapes, HD high-definition tapes. CNN: At the end of the video, you reveal a new tattoo. CNN: Had you ever met Michael? The Game: I never met him in person, but he tried to mediate a truce between myself and Curtis Jackson [aka 50 Cent], and I wasn't having it at that time. CNN: How did that happen? Did somebody call you and say, "Please hold the line for Michael Jackson?" The Game: At first my managers called me and they said, "Mike -- Michael Jackson -- is going to want to talk to you in an hour. Exactly an hour." So I waited an hour, and I'm like chewing on my fingers in the hotel room ... and the phone rings and a guy comes on and he's got an English accent. He's like (affects an English accent), "Hello Game, I have Michael Jackson on hold for you." It was just cool. And then I was like, "Yo Mike, we gotta slow down, man!" This was at the height of me and 50's little beef, or whatever people called it, but I talked to him for another 35 minutes on why I couldn't do it at that time, and at that point in my career, and he was OK with that. He said one day if we decided to do it -- myself and Curtis' camp -- we could reach out to him. We never got a chance to do it. CNN: So the video also features Chris Brown. It's the first track we've heard him on since the hearing last Monday [June 22]. The Game: They were really edgy about getting on it. I think [his managers] wanted Chris Brown's first look to be kind of strategically thought out, and I came so fast with the Michael Jackson tribute -- but we talked it over, and at the end of the day, they thought it was a good idea, so we went ahead and did it. CNN: How is Chris? I'm sure you guys talk all the time. The Game: He's like a little brother to me. I talk to him all the time, and I give him my support. You know, I'm no stranger to trials and tribulations in life, and the court system. CNN: What are your thoughts about how Michael Jackson died, and how it seems as though prescription drugs may have been involved? The Game: My thoughts on Michael Jackson are always the same. It doesn't matter, the form or fashion he died in. He's iconic to me, and his untimely demise is felt around the world. You got certain people saying, "Oh everybody's loving Michael now," but that's neither here nor there. Me, myself -- I loved Michael Jackson to death. My mom sent me a host of pictures with all my "Thriller" shirts on, and the jacket with the zippers and glove -- me, my sisters and brothers -- so I really don't care. I just know he left an impact on the world. I think he's the most cried-for human being since Jesus Christ. It's just my opinion. CNN: Are you thinking about donating part of the proceeds from the single? The Game: Oh, all the proceeds of anything that I do that has anything to do with Michael Jackson will go to his family and his children. And that's just the bottom line.